Thanks to all you pisco-loving fools who ventured out into the arctic air last night to join drinkboston.com at the Alchemist Lounge for pisco cocktails and Peruvian dance beats. 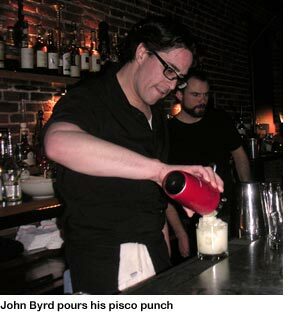 There was a whole lotta shakin’ goin’ on behind the bar as John Byrd and Nicky Poirier whipped up nine(!) different drinks using pisco from Macchu Pisco, a small producer of the grape-based spirit. My fave mixtures were the nicely sweet-n-sour Peruvian Americano (pisco, apple liquor, falernum, lemon), the elegant and refreshing Cucumber Pisco Martini (pisco, cucumbers, simple syrup), and the Pisco Punch (see recipe below), which was as soft and sweet as a spring breeze — something we all longed for last night. Thanks to DJ Brother Cleve for the excellent tunes and to Alchemist owners Relena Erskine and Lyndon Fuller for offering up their lounge as the evening’s venue. 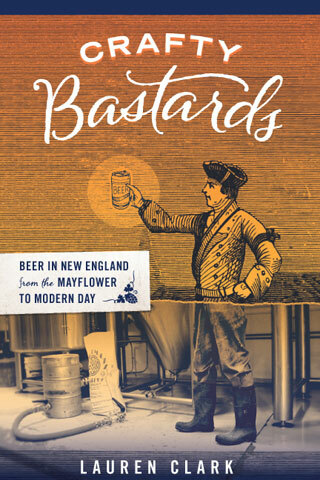 If you want to get on the mailing list for drinkboston.com events, email drinkboston (at) comcast (dot) net. The Pisco Punch recipe, direct from John Byrd: “We took 2 bottles of pisco, 1 can of pineapple juice, .25c of simple syrup, 1 whole pineapple chopped and one big splash of falernum. We let it sit for 4 hours and shook [each serving] up with an egg white. After the party we added grape halves & some very inexpensive California champagne, and that was very good!” Served in a double rocks glass over ice. Three cheers to jolly John, lovely Lauren and crazy Cleve! Thank you for introducing us to the new, lively world of the Alchemist. I do confess that I drank Heiniken’s though instead of that Aztec warrior fire water stuff. I drank so much Pisco in the last 3 days that I woke up with a Peruvian passport in my coat pocket. “Come to think of it — I’ll have a Pisco Punch” could be a new ad campaign. I’ve had the firewater before but this brand was smooove. Sandeep’s just waiting for the Old Monk tasting party, haina mera yaar? My name is Jose Phon. I am excited to see Pisco Punch all over the place. We would love to hear about your diverse recipes for Pisco. My associates and me are in the Pisco business. Our pisco is called Inca Gold Pisco and it is interesting and exciting how colossal Pisco is becoming. If you want more information on Pisco Punch, Guillermo Tora-Lira will be coming to Atlanta for a book signing. Details will be posted on http://www.IncaSpirits.com. For more information, please contact me at info@incaspirits.com.